The Purple Line Extension design-build contractor for Section 2 is moving forward with construction activities in preparation of the construction staging area in Century City. In order to support excavation of the tunnel boring machine launch box, a full closure of Constellation Blvd. * between Century Park East and Avenue of the Stars is scheduled to start Friday, September 21, 2018. During the closure, public access will be prohibited to the driveway on the north side of Constellation Blvd. (behind Watt Plaza). 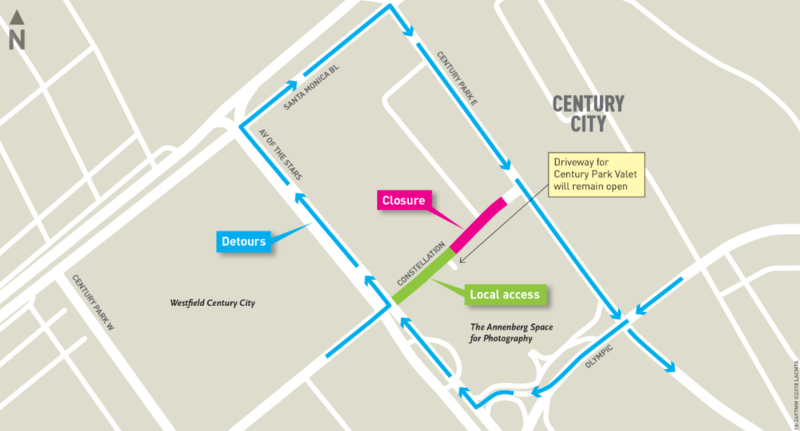 Constellation Bl at Century Park East will be closed to construct a launch box for the Purple Line Extension tunnel boring machines digging the twin tunnels for the underground subway through Century City. Similar to constructing a station box, the design-builder will have to pile, deck, and then excavate to create the launch box. A work zone with protective concrete barriers, fencing, and sound blankets will be established to support the work. During pile installation, 70- to 90-foot holes are augured into the streets along the perimeter of the launch box. After the piles are in place, the street and sidewalks are excavated and replaced with temporary concrete deck panels which will restore traffic and access to driveways while excavation continues underground to create space for the tunnel boring machines. Work begins at 7pm on Friday, September 21, 2018 with intermittent lane closures through Sunday, September 23, 2018. *Currently, the project is approved for a 9-month closure. The contractor is studying the possibility of a 6-month extension for a total of 15-months. Construction Relations will continue to notify the community of the schedule as we proceed. Use Santa Monica Blvd., Avenue of the Stars, and Century Park East as alternate routes. There will be no public access to the driveway on the north side of Constellation Blvd. (behind Watt Plaza). There will be limited access for large trucks, deliveries, waste collection, and construction. Flaggers will be present during work hours to provide access. Local access will be maintained on eastbound Constellation Blvd. up to the closure for Craft LA Valet and Century Park Towers driveway. During the full closure, public access to Constellation Bl driveway behind 1925 Century Park East and 1875 Century Park East driveways will be limited. Century Park East will be open to thru traffic. Access to all other driveways & entrances will be maintained. Access for emergency vehicles and first responders will be maintained for safety. The sidewalk on the south side of Constellation Blvd. will be closed until further notice. Construction is a dynamic process and information is subject to change without notice. Additional closures may be necessary. Detour routes are subject to change at the discretion of the Los Angeles City Department of Transportation. From the current terminus at Wilshire/Western, the Purple Line Extension will extend westward for about nine miles with seven new stations. Visit metro.net/purple to sign-up for construction updates and to learn more.